Join the Mythgard Movie Club on August 2, 2018, at 8:30pm ET for a discussion on Edward Scissorhands (1990). Written by Caroline Thompson and directed by Tim Burton, this dark fantasy comedy romance stars Wynona Ryder as Kim and Johnny Depp as the metacarpally bladed Edward. The story follows the relationship of Kim and Edward as they meet, grow close, and (spoiler alert) fall in love. Coming off the critical and financial successes of Batman (1989) and Beetlejuice (1988) – okay, okay, and Pee-Wee’s Big Adventure (1985) – Edward Scissorhands represents something of a passion project for Burton. He conceived of the story as a child and commissioned Caroline Thompson to write the screenplay while working on Beetlejuice (she also received co-writer credit for the story). As such, Burton has cited Edward Scissorhands as his most personal work, and the film marked the beginning of a beneficial collaboration between the two, as Thompson went on to write screenplays for two of Burton’s later films: The Nightmare Before Christmas (1993) and Corpse Bride (2005). Thompson also co-adapted Edward Scissorhands as a theatrical ballet set in the 1950s with choreographer Michael Bourne in 2005. The film received many accolades after it was released, garnering nominations at both the Golden Globes, Academy Awards and BAFTA, mostly for technical and musical categories. In addition, the film won the Hugo Award for Best Dramatic Presentation and the Saturn Award for Best Fantasy Film in the same year. The film was also a smashing box office success, more than quadrupling its $20 million budget, despite an initially limited release and scaled-back marketing efforts. Edward Scissorhands remains an iconic influence in cinematography and culture, with references and allusions abounding in many later films, television shows, music, and other media. In addition to the theatrical ballet, the story was adapted (or rather, extended) as a well-received graphic novel, Edward Scissorhands: The Final Cut, published by IDW in 2016. In 2013, the discovery of a fossil for a previously unknown extinct arthropod in Canada prompted the discovering scientist to give it the name Kootenichela deppi, after Johnny Depp, because of it’s scissor-like claws. Curtis Weyant is a Signum Grad School alumnus who sometimes lets his fingernails grow longer than they should, but not long enough to pretend he has scissorhands. He also blames Edward Scissorhands (along with Reality Bites) for his lifelong crush on Winona Ryder. A digital marketer by trade, he co-hosts the weekly podcast Kat & Curt’s TV Re-View and occasionally pecks away at his own creative work. 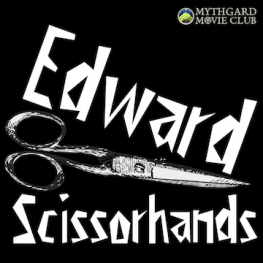 Join the Mythgard Movie Club on August 2, 2018, at 8:30pm ET for a panel discussion on Edward Scissorhands.